A variety of buildings, most of them architecturally notable, surround the park: elegant turn-of-the-century apartment buildings, brownstones, and the mansions that make up the Curtis Institute and the Art Alliance, as well as modern high-rises. The strip of Walnut Street near Rittenhouse Square features a good selection of upscale shops and restaurants, but the other streets near the park are more welcoming. There is a sense of community within the Square: an interaction between the habitues of the park that one actually feels that this is the City of Brotherly Love after all. The urbanist Jane Jacobs correctly describes this area of Philadelphia as the perfect urban neighborhood. The park is separate from the aggressive hustle and bustle of the Walnut/Chestnut Street shopping areas, and its boundaries are well defined. Yet the park incoporates itself into the heart of these busy streets, separating them from the leafier residences on Locust, Spruce, Delancey and Pine Streets. 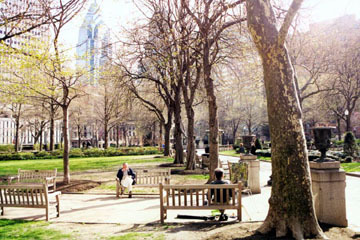 Being in the heart of an east coast downtown, the park is accessible by foot and all means of public transport. The park also features wonderful sculptures and is surrounded by some of the most elegant urban scenery in the United States. The relative compactness of Rittenhouse Park adds to its visual appeal, as does the elegance of its entrances. It is a true public gathering place—a great place to people-watch and sit, while savoring the offerings of one of the neighborhood's many interesting cafés and bakeries. 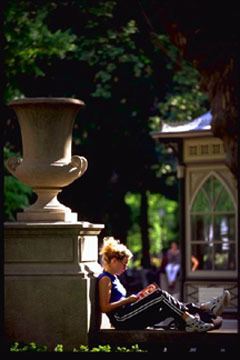 Located in the heart of Philadelphia, PA, between 18th and 20th Streets, Rittenhouse Square is a gorgeous Center City landmark surrounded by a commercial and residential district. In its earliest days, the Square, then called Southwest Square, was a pasture for local livestock and a convenient dumping spot for "night soil". By the late 1700's the Square was surrounded by brickyards because the area's clay terrain proved better suited for kilns than for crops. In 1825 the Square was renamed in honor of David Rittenhouse, a brilliant Philadelphian astronomer, instrument maker and patriotic leader of the Revolutionary era. During the building boom in the second half of the 19th century, the Rittenhouse Square neighborhood became the most fashionable residential section of the city, the home of Philadelphia's "Victorian aristocracy." Some of the mansions of that period still survive on the streets facing the square, although most of the grand homes gave way to apartment buildings after 1913.